I’m coming up on the six month mark of blogging. Wow – 6 months! Part of me can’t believe I’ve been blogging for six months…and the other part of me feels like I’ve been doing this for forever! And kicking myself for not getting this thing started sooner, because I love doing this. Since I’m coming up on six months, I started looking back at my old posts. Thankfully I’m come quite a ways. But one of the subjects I wanted to re-visit was my very first post which was 4 Tips for Organizing a Kids Craft Area. We had a pretty good system for organizing our craft supplies and a nice area for the kids to do crafts. I had mentioned in that post that I knew I would have to switch things up when our new little guy got mobile. He just turned 7 months old, and can get anywhere he wants with a combination of rolling and crawling. Overall having this third baby has been a breeze, but there are a couple things that have been significantly harder. One big thing is trying to keep the boys’ “big boy” stuff out of reach. I’m pretty sure I have to ask the boys ten times a day, “Please pick the Legos up off the floor!” On a side note – if you have suggestions for keeping Lego play contained when there’s a baby in the house, I need them! But today I’m going to show you a little bit of how we’ve re-arranged our craft supplies now that we have a baby in the house. …and stuck it in this cupboard in our kitchen here. I know everyone doesn’t have cupboard space for things like this (we have lived with some *small* kitchens before, so trust me, I’ve been there!). But we are thankful to have this space, and it works great for this purpose. If you don’t have extra cupboard space, a great option is to buy one of those big storage cabinets. And getting one with a small latch might be a good idea to keep little ones out. I kept the things the boys get out the most on the lower shelves so they can reach it, but not so low that baby can reach it. On the very top shelf, I keep some of my supplies or the things the boys need to ask me for. On the very bottom I have the games, cards, etc. in a bin that snaps closed. We’ve been using this for a few months and it’s been working really well. We keep up the same system I talked about in this post of sorting the drawings and crafts every once in a while and deciding what to keep and what to toss. I also made a new, small craft area in our den/office. We rearrange some rooms in our house, and put our den/office area where our bedroom was. It gave us a bigger room to use as a place for us all to hang out. We have our computers in there, all our books, and craft supplies. My parents brought over my mom’s sewing table for me to use. We use it for bigger art projects we are doing. 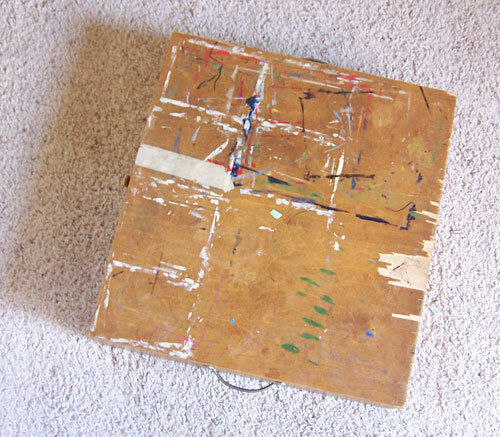 For smaller crafts, the boys are using this little art table. As you can see, it’s been well loved and used! It’s what I used as a kid, my mom used as a kid, and my great-grandfather made – and now my boys have the chance to enjoy it! How neat is that? I slip it under my sewing/craft table when it’s not in use. 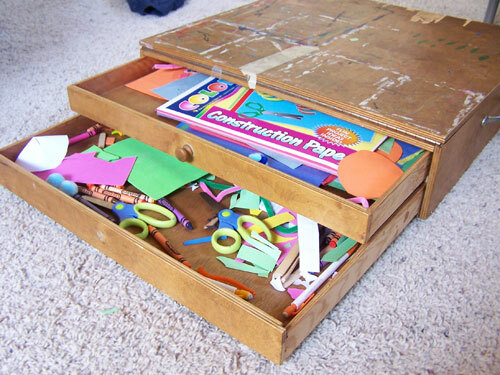 It has two thin drawers that are perfect for some construction paper, crayons, scissors, and other craft supplies. It has a bigger compartment here where we put some bulkier stuff. Like I mentioned in my original post, I like keeping a supplies available for them to use, but I limit what I make available so they don’t use up all of our craft supplies in one afternoon. The bulk of our craft supplies the closet of this room. This is also where I keep all my fabric, sewing supplies, yarn, paint, and craft supplies. There’s the minimalist part of me that thinks we have too much craft stuff. And then there’s the other part of me that’s very thankful to have so much fun stuff to create with. I usually balance it out by going through it all every few months and deciding if there’s anything I need to toss out. The cupboard in the kitchen with our craft supplies stays pretty well organized. The other craft area, not so much. It’s definitely still a work in progress. We’ve been working with the boys to encourage them to clean up when their all done. How do you organize a craft area for your kids? Is this an area you struggle with? 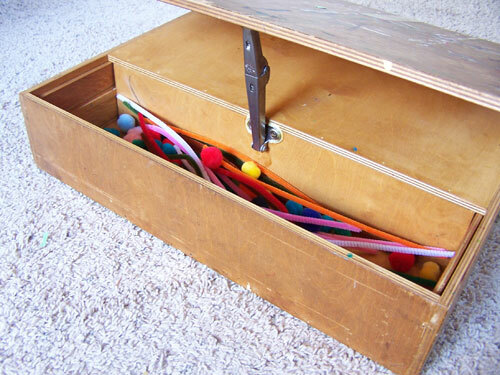 I love that you have that little craft table/drawer unit, passed down through your family! It’s such a clever design too 🙂 I’ve used a similar strategy with putting some crafts up higher so they don’t get used up (and are safe from the baby), then my girls started to climb! LOL now I’m always missing the art staples like scissors, tape etc… Are your boys climbing yet?